You are here: Home / Investors / Stock Analysts / PVH Corp (PVH) in Crossroads: Can Brand Strength Aid Stock? PVH Corp (PVH) in Crossroads: Can Brand Strength Aid Stock? 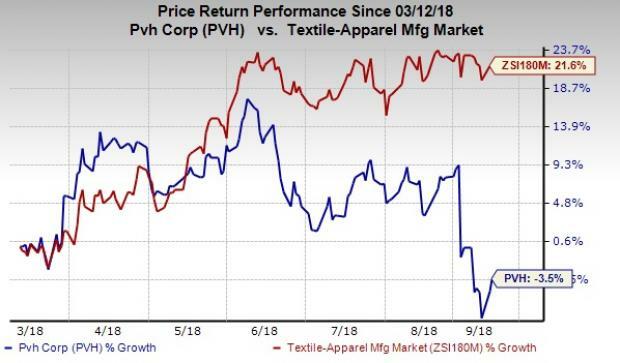 PVH Corp PVH is putting up a stellar show with its quarterly performances, significantly gaining from the diversified portfolio of brands and strength in Calvin Klein and Tommy Hilfiger in particular. Further, solid marketing strategies, including brand expansion and technological advancements have been aiding the results. Notably, the company has marked 17th consecutive earnings beat, with eighth straight positive sales surprise in second-quarter fiscal 2018. However, this outstanding surprise history and growth initiatives failed to lift up investors’ confidence in the stock. In the past six months, shares of the company have lost 3.5% against the Textile-Apparel industry’s 21.6% rally. The industry currently dwells among the top 11% (29 of 256) of all Zacks industries. The company’s VGM Score of D is further highlighting the stock’s dismal run on bourses. PVH Corp has been witnessing softness across its Heritage Brands in comparison with its other brands. Apparently, revenues at this segment dipped 3% year over year in second-quarter fiscal 2018, while it advanced 18% and 15% at Calvin Klein and Tommy Hilfiger, respectively. Consequently, management issued a soft fiscal 2018 sales guidance for Heritage Brands compared with sales growth projections for other brands. For fiscal 2018, sales are anticipated to increase roughly 8% on both reported and currency-neutral basis at Calvin Klein and 9% (or 8% on a currency-neutral basis) at Tommy Hilfiger. Meanwhile, the company expects sales to grow roughly 1% year over year for Heritage Brands. Additionally, the company’s overall sales in the second half of fiscal 2018 are expected to be weak in comparison with the last year’s number due to the 53rd week in fiscal 2017. Management anticipates total sales to be hurt by roughly $150 million, which includes $80 million due to the reduction of 53rd week in the fiscal fourth quarter versus the prior year, and $70 million, owing to the shift into the first half of fiscal 2018, which was in the second half of fiscal 2017. PVH Corp has been taking actions to drive growth at its Heritage Brands division by expansion, along with enhancement of e-commerce presence. Recently, management announced the launch of IZOD brand in Europe, spreading across Spain, Germany, the Netherlands and Scandinavia in fall this year. This American lifestyle brand will feature products like polo, t-shirt, sweater, knit, denim and many more. The collection will be accessible through stores and online, including El Corte Ingles in Spain, Hudson’s Bay in the Netherlands and Galeria Kaufhof in Germany. Through Zalando and Boozt, it will be available online. PVH Corp plans to expand the brand’s distribution in Europe, Russia and the Middle East regions in spring next year. In another development, the company launched an integrated e-commerce site, allowing cross-brand shopping, for its Heritage Brands. The launched sites include IZOD.com, VanHeusen.com and styleBureau.com, which enable customers to purchase items produced by these brands via a single shopping platform. Launch of this multi-platform website is expected to boost customers’ shopping experience by offering various choices, flexibility and convenience. Notably, StyleBureau e-shop will help customers to buy men’s clothing and accessories by the company’s IZOD, Van Heusen and EAGLE brands. The e-shop will also cover a wide range of PVH Corp’s offerings beside shirts and ties under the Calvin Klein and Tommy Hilfiger brands. These moves are likely to revive the sales graph for Heritage Brands and boost the company’s profitability. PVH Corp boasts a healthy balance sheet, which provides it with the financial flexibility to drive future growth. This also helps in boosting shareholder value via share buybacks. In the first half of fiscal 2018, the company bought back 900,000 shares for roughly $137 million under its $1.25-billion standing authorization that extends till Jun 3, 2020. Since its inception, it repurchased nearly 7.7 million shares for $829 million under the program. Driven by a sturdy first half, management raised fiscal 2018 earnings view. Further, it issued an upbeat outlook for the fiscal third quarter. Adjusted earnings per share are now envisioned to be $9.20-$9.25 for the fiscal, up from $9.05-$9.15 guided earlier and $7.94 earned in fiscal 2017. The Zacks Consensus Estimate is pegged higher at $9.26, up 7 cents in the last 30 days. Currency tailwinds are also contributing to the company’s results. Notably, favorable currency is likely to boost adjusted earnings by roughly 7 cents per share in the fiscal. Presently, the owner of Calvin Klein has a Zacks Rank #3 (Hold). G-III Apparel Group, Ltd. GIII has an impressive long-term earnings growth rate of 15%. You can see the complete list of today’s Zacks #1 Rank (Strong Buy) stocks here. lululemon athletica inc. LULU has outpaced the earnings estimates in each of the trailing four quarters by an average of 19.2%. Michael Kors Holdings Limited KORS has pulled off an average positive earnings surprise of 35.7% in the last four quarters.